I hope the weather is as Springy and beautiful where you are as it has been here in Kentucky. I've really missed sunshine and afternoon walks with my sweet doggie, Maddy! This dress (with pockets!) is one of my favorite go-to items. It's pretty low-cut and boobilicious so I keep work-appropriate by adding a buttoned cardi. I really wish I could find more dresses with this cut as I feel it's flattering. It's not too flowy and no one (not even the bitchy lady at the dry cleaners) will ask me when I'm due! I went to Target right after work Monday night in hopes of scoring some of the fabulous Liberty of London for Target designs - I lucked out! My store's Liberty of London selections had barely been touched. SCORE! The first thing my eye fell on was the peacock halter top. The other tops didn't really appeal to me as much, but I did buy another top. I've not tried it on yet so we'll see if I keep it or not. A lot of the reviews online about the Liberty of London stuff complained about the shirts being polyester. When you're buying a $20 shirt at Target what the heck do you expect? I know...natural fibers are awesome blah blah blah. This top would look terrible in cotton and would cost a fortune in silk. You either get a fabulous design, a natural fiber, or a cheap price. Pick two. 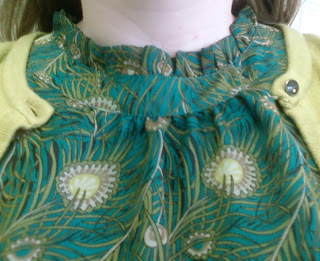 How cute is the ruffle at the neck? The back has a little button and a keyhole opening. I'm not gonna lie: I had to put the shirt on backwards, button it, then turn it around. I was all thumbs this morning. I didn't try on any of the clothing so I don't know about the sizing but I did go up a size (this is the XL) because I was worried about how it'd fit in the hips. Good thing b/c it's snug at the bottom and a little loose up top. I'm not displeased w/it, but I did find myself making sure it was pulled down all day. I really love all these fun prints and can't get enough of the great, bright designs. I picked up a bedding set (which I'm not 100% on, but didn't want to regret not getting it later), a picture frame, and want to go back for those darn prep bowls we're all crazy about. Did any of you check it out in the store? It's all online, but sold out for the most part. Tonight I'm coming to you from Target where I've finally gotten a chance to check out the Liberty for London line. I must say as far as the adult woman's clothing goes, it's just meh to me. Here are a few pics I just snapped. The first pic with the halter style top were the cutest prints to me. I actually bought the teal and green peacock printed halter. This peacock print was not as cute as the other one. I wasn't digging any of the dresses except for this next picture. It was the cutest by far. The household and stationary items were great! I bought this pillow in the same pattern as my top (notice a pattern here?) for $19.99. It has this bright green velvet backing that I love! I can't wait to use it on my new grey couch!! If you haven't made it over to Target yet to check out the Liberty of London collection, then you should head over and take a look! It's definitely worth checking out! The weather has taken a marked turn lately and it's VERY appreciated. No more single-digit nights and frosty mornings! I love spring time and am showing great restraint in not wearing every summer dress I own!